Organisation is an obsession that i have as i love my yearly diaries/journals. Two Years ago i purchased my Filofax Personal and since i knew i was heading up to the UK this January i knew i could purchase my 2013 Day to Day Page Refills from there. That i know am using for work actually and my day to day journal for myself. Next i purchased my 5 year diary which i thought was very clever. Each page has 5 years of the same day and i thought it would be perfect for my blog journey. Basically next year i can review what i had done the year before and go from there. It was a bargain for £9.99. 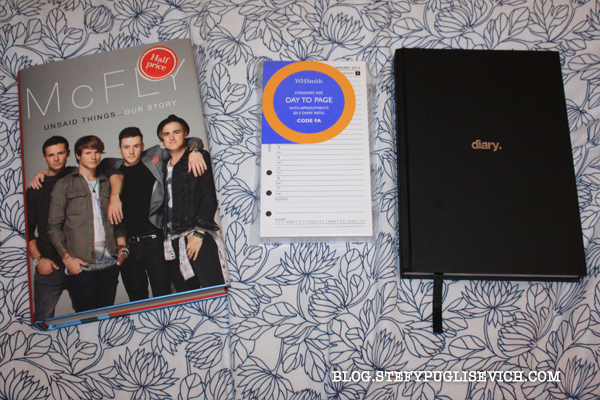 As for the book, I have been a fan of MCFLY since BUSTED were born! I have every single cd and album they have come out with and just couldn't resist not getting this MCFLY UNSAID THINGS when it was on half price at waterstones. I couldn't find BLOG INC. It's sold out everywhere! Not found in WhSmith and even Waterstones. Hopefully when it is back in stock, i will definitely purchase it. DID YOU PURCHASE YOUR DIARY FOR 2013 YET? I find it so easy to use. especially the fact that i am now able to use it for 5 years!